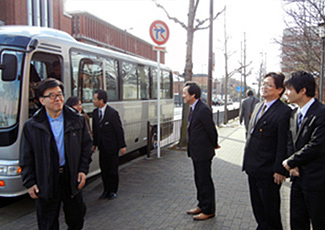 A seminar for presidents of South Korea University Co-ops, which are members of Korea University Co-operative Federation (KUCF) was held in Kyoto and Kobe in January 17-20, 2013. 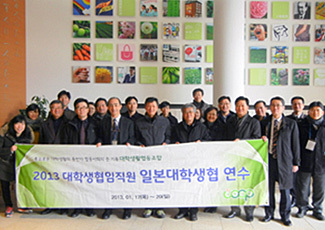 There were 18 Korean participants (presidents and staff) from KUCF and its 11 members. Meanwhile, participants from Japan were academic/staff from Doshisha University and Kobe University as well as staff from both university co-ops, and also Hanshin Business Association and bloc. On the first day, the participants went to Doshisha University and Doshisha University Co-op. They visited co-op store in Ryoshinkan (Imadegawa Campus), which was opened in November 2012 and dined in the co-op dining hall. The participants visited Co-op Kobe’s Commodity Inspection Center on the second day. After doing observation at a large-scale retail store, they also attended a lecture session and had discussion at Hanshin Business Association. They learned about the roles of a business association, roles of university co-op from a faculty staff’s point of view and how to boost the students’ participation. This year marks the first anniversary of KUCF establishment. The number of university co-ops in South Korea has increased by half, to more than 30 university co-ops. In a climate of rapid change, it is time for a new direction for KUCF. This year’s training is an enriching experience for both parties.